As a place to buy affordable fresh food and other goods Dalston's Ridley Road market is hard to beat. Competition from the 'loss leaders' offered by Sainsbury and the new local Tesco Metro, keep the traders on their toes. They're up at all hours, rain and shine, working hard to earn an honest living and provide a service to all sections of our diverse community. But it's not just Dalston's best kept secret. People come from far and wide to get a bargain, to join in the fun and to buy what they can't find elsewhere. But Hackney Council has been prosecuting a number of Ridley's market traders. They had to appear in Thames Magistrates Court on 7th March. One, Mrs Janet Devers, elected to go for a jury trial in the Crown Court. The charges are that she offered fresh vegetables in pounds and ounces, not kilos, and that she sold unweighed produce by the bowl or the bunch. Three other traders faced similar charges but they pleaded guilty and were ordered to pay fines and costs of £615 each. The Council were claiming its costs totalling £5,700 from them. 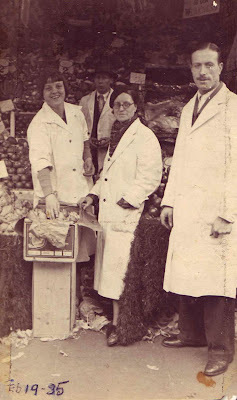 Janet Devers in Ridley Road market and, below, Janet's mother who was also a market trader from the age of 17. You may have followed the story about Dalston's "metric martyrs" in the national papers and you can read more about it here. The traders argue that their customers are happy to buy by the bowl or the bunch because "what you see is what you get". But Hackney Council say this gives the traders an "unfair competitive advantage" - although it has produced no evidence of any complaints by customers or other traders to back this up. Janet Devers said "Although the supermarkets charge 79p for a pepper, we charge £1 for a bowlful. It's great value but Hackney say we have to show the number of items in the bowl. Try doing that with every bowl of little hot chillis or grapes". Fresh produce is sold by the bowl or the bunch in markets all over London without complaint. So why is the latest rash of criminal prosecutions only facing our local market traders? Why are the Council bean-counters going bananas in Ridley? When you look behind the newspaper headlines and listen to the traders, you get to see the bigger picture. Hackney has recently recruited extra 'enforcement officers'. But it's not the fly-by-nights and chancers who the Council are coming down hard on. Nor is it just the 'metric martyrs'. The Council's new policies are hitting some of Dalston's oldest family businesses as well as some of the most vulnerable new traders who are struggling for a start in life. Larry Julian is the Chairman of the Ridley Road Market Traders Association. Larry's family, and many other Dalston families, have been been trading in Ridley market for four generations. They know a thing or two about making a successful market. Above, Larry's parents and brother in Ridley Road in 1952 and, below, his grandfather in Ridley market in the late 1940's. Larry said "The Council is just not listening and it's not helping the market. There were 40 empty stalls last Christmas - it unheard of. Traders feel we're being driven out of the market. People say the Council just haa its eyes on the land for development"
George Mayo was the last trader to bring produce to Ridley by horse and cart. These photos (above) are of George's parents. George was told that his mother worked so hard that he was actually born on the market stall. Below is George with his daughter Lee, who also trades in Ridley, and their latest horsepower. George's grandson is also a Ridley trader. One of the problems facing traders arose in 2000 when the food store at 3-4 Birkbeck Road was vandalised and set fire to. It has remained unrepaired, and virtually unusable, ever since despite the traders offering the Council to meet the costs of refurbishment themselves. Another problem concerns the yard at 7 Birkbeck Road. It provides storage for non-perishables and the market barrows. The Council has refused to accept further rents from the traders for the use of these Birkbeck Road sites, it has denied their tenancies and has demanded possession. Without these essential facilities where can traders store goods and barrows when they have to be cleared from the market every night? The Council's explanation for withdrawing from negotiations for new leases of the two Birkbeck Road sites was that "the Council's internal policy and procedure has changed... with public consultation, the creation and completion of the Dalston Area Action Plan, the Council is investigating its options for regeneration of the market area..." So - nothing to do then with a consultants' recommendation that "LBH may wish to give consideration to alternative use of this (Birkbeck Road) area of land possibly for residential development…"? The traders obtained a copy of the consultant's report, commissioned by the Council, the day after it told them that there were no plans for the market. The consultants also advised that "in many local authorities, markets have been seen as 'cash cows' providing a very significant revenue". In other words they recommended that the Council should raise the rents and run the market for a profit - although that would mean higher prices for customers which many in Dalston can not afford. And, despite the astonishing £430,000 charged each year to the Markets Account for refuse collection, the consultants said "This is probably the worst market environment we have ever experienced in over 30 years... it's positively third world". Just recently the Council has issued letters to some 20 traders advising that it will be recommending non-renewal of their licences. A special "Council officers only" Licensing Panel has been set up to hear their appeals. Elected Councillors will play no part, in contrast with alcohol licensing where it is only Councillors who make the decisions. And although it was said that the Licensing Panel would be "independent", in fact the Council's Head of Markets sits on the Panel. Market traders have always had the right to appear and make their appeals in person to the decision makers. But the Council's letters initially told traders that their appeals could only be in writing and that, if they attended the hearing, they could only speak to answer questions put to them. Nor are they entitled to be represented. What other forum in society could dispose of a person's livelihood in such an summary fashion? One hopes that the traders' demands for a fair trial will see the procedures changed. If traders troubles were not already enough, the Council after "consultation", has now painted double yellow lines all down Ridley market. Any trader taking more than 15 minutes to unload his or her van, or load up at the end of the day, faces a parking fine. This on top of paying the annual £495 business parking charges (in the hope of finding a vacant bay) and the £21.00 per week increase in electricity charges just imposed. At the recent Dalston 4 London conference everyone agreed that Ridley Market is at the hub of Dalston Town Centre. It's a place where specialist food from all over the world is presently affordable - whether you want to make curry goat, African yam or English apple pie. It's where people of all races and backgrounds are united in a common purpose. This diversity is what makes Ridely - and Dalston - unique, vibrant, attractive and sustainable. But there is something seriously wrong going down in Ridley. Behind their good humour and charm many traders are severely demoralised. Despite the talk of regenerating the market they fear the opposite is planned. Instead of consultation and partnership with the traders, one sees a "top-down" and punitive approach to problem solving. Many traders' livelihoods, and a great community resource, are at stake. The supermarkets will be pleased. 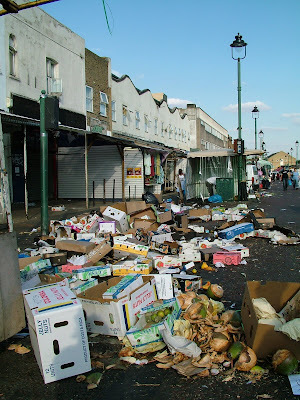 Why is it that at a time when Farmers Markets are growing in popularity in middle-class areas good honest to-goodness fruit and veg markets in working-class areas are being run down to the point of dereliction? Markets are good for everyone. They offer a good range of food that most people are unlikely to see elsewhere in mainstream shops. This is also a time when people are being encouraged to eat more fruit and veg. So what happens? Markets where people can easily, and cheaply, obtain fresh fruit and veg are closing down because councils think they can get more money from property developers. Markets are important for the wellbeing of local communities. Cracking post, by the way. The good news, since this post was written, is that Larry Julian's protests have caused the Council to back down. The traders right to appear and speak at their own appeal hearing has now been restored.